One can imagine our ill-fated heroine of the novel bowed over her bed each night, praying that old English prayer in earnest. There was no doubt in her mind that the estate was haunted and that the two children whom she was charged to care and protect were the victims of malicious, poltergeist type spirits who were bent on destroying the children, herself and perhaps the entire estate as part of their wrathful plan. But, what do you believe? Nobody can read a good ghost story without asking themselves that question. And, in the bright lights of your English classroom, it might be very easy for your students to laugh and mock and deny the existence of ghosts. But, are they so confident in the dead of night, with only the moonlight and the wind for company? Now is your chance to find out. 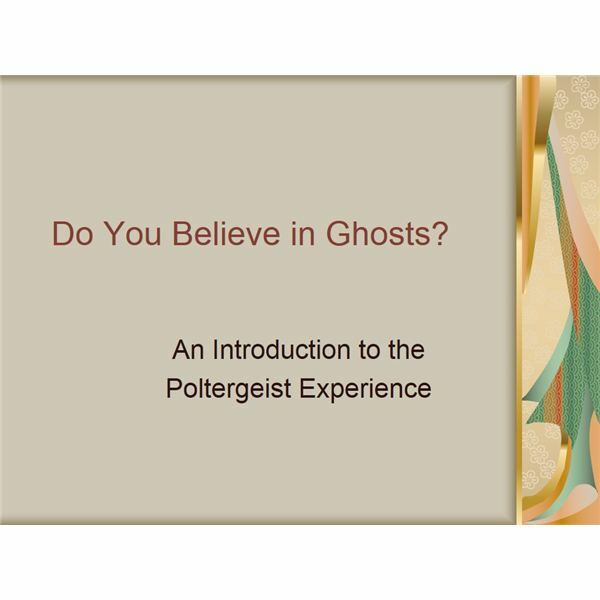 First, use the downloadable PowerPoint to “teach" them what a poltergeist is and see if they feel that a poltergeist is what was “haunting" Miles. Then, use the writing prompt sheet to assign each student a writing task: “Write a Ghost Story." However, for added fun and flair, stipulate that they have three nights to write the story, with the emphasis on nights. They cannot begin composing their tale each night until the sun goes down. They have to write in the evening hours, well after the sun has driven away all the shadows that lurk outside and in the corners and crevices of their very rooms. Now teachers, see how brave your students are! PowerPoint Presentation: Do You Believe in Ghosts?